Design Brief: The remit was for a future proof, Smart Home design within a £20K budget, providing not only the flexibility to upgrade equipment over time, but also an AV/IT infrastructure that would add to the desirability of the property at the time of re-sell. Infrastructure: At the core of the system is a "4x4 HD Matrix", allowing any of 4 sources e.g. two SkyHD Receivers, an AppleTV and Blu-ray Player to be switchable to any combination of 4 rooms, so that the Client, for instance, could play a Movie in the Basement Cinema Room and then retire to his Bedroom to continue watching it. 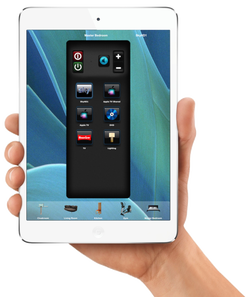 The entire system is controlled by "iRemoteControl" software running on iPads and iPhones. Basement TV Room: ​There was no such audio compromise in the Basement, where audiophile In-Wall and In-ceiling Morel speakers were deployed, together with a (curvaceous!) wireless Subwoofer, to create a discreet, but a completely enveloping Surround Sound, Home Cinema experience. Multi-room Audio: There are also five Sonos players installed in all the main rooms in the property, allowing high quality music and radio to be played throughout the house at the press of a button - again via an iPhone or iPad. Door Entry & Security System: The Door Entry System provides state of the art security with the ability for the Client to answer the front door bell from anywhere in the world on his iPhone and speak to, as well as see the person. Better still, all communication - both video & audio - is captured for future reference. In addition the system can be set to act as a security camera - capturing any movement within a defined range of the doorbell!